Part / भाग – 3 (Page No 9). Section 3: Language – 2, English / भाषा – 2, अंग्रेजी. 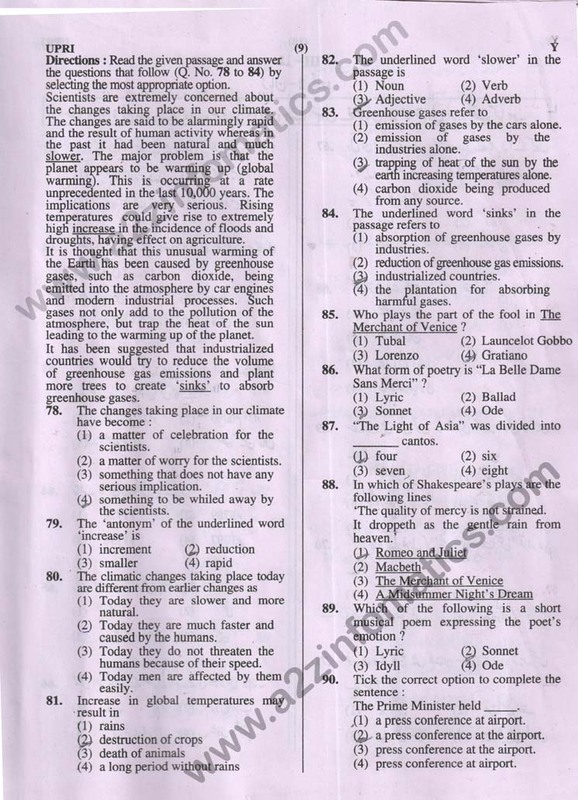 There are total 30 questions in this section of official UPTET UPRI-2016 question paper SET-Y, the weight-age for each question is 1 mark. Important: The UPTET 2016 Official / Original Question Paper (UPRI-2016) is made up of total 32 pages, link to all pages is given at the bottom of this post. You are now at page number 9 of UPTET 2016 Upper Primary Level (UPRI, Paper-2, Class 6 to 8) Fully Solved Question Paper SET-Y in Hindi / English. To download UPTET 2016 UPRI Paper-2 in PDF format, visit other pages of this post (links given at bottom). The UPTET 2016 UPRI (Paper-2, Class 6-8) exam was held on 19 December 2016 in the Second Meeting (02:30 Pm – 05:00 Pm).